Abbie's life feels like one big rain cloud since her parents split up. Now she lives with her mum and sisters in a grotty flat. Only new friends, Ben, Summer, and gorgeous, guitar-playing Marco, offer Abbie a silver lining. But then Abbie has a bright idea to turn her family's fortunes around. She's always loved making her own luscious beauty products. 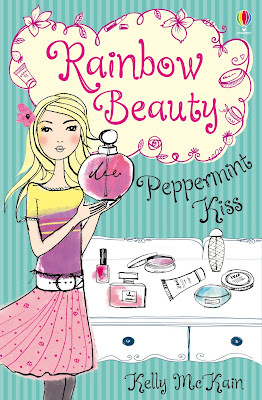 Could opening a new business - the Rainbow Beauty parlour - bring her family a pot of gold and heal their hearts too? Abbie is pretty, clever, fun and relatable. I really liked her as a character. Her sisters were cool too, with their different personalities. They all seemed so...real! This book is beautifully written. I also really liked Ben, Summer and Marco. They reminded me of my own friends! I especially liked the chapter where Abbie starts at her new school and meets new people. The plot is fun to read, and it's lovely to see the close relationship Abbie has with her mother and sisters. It was nice to see them all stick together during the hard times. Occasionally it was emotional, like when Abbie talked to her dad, but other than that it's a pretty cheerful read! I love the cover so much. It's pretty and I like the colours that have been used and the swirly writing. The covers for this new series look similar to Kelly McKain's 'Totally Lucy' series so it's easy to tell that they are all by the same author. Lovely review, Amber :) I like the fact that her family sticks close to each other because quite often in books, they drift in difficult times. May have to check this out! Thanks Rebekah! I agree. Most books are about people drifting apart permanently, but this one was about sticking together. It was lovely to read! I used to love Kelly McKain when I was younger but I'm not sure if it's my thing anymore. I might try this though, to see if I like it. I used to devour her books!